Bring a pan of water to the boil, add a good pinch of salt and the turmeric. Add the cauliflower and peas and boil till just tender. Drain and leave to cool. In a frying pan over a medium-high heat, heat the oil. Add the cumin seeds, and cook until the seeds crackle. 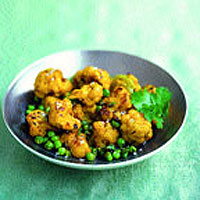 Add the peas and cauliflower and sauté, for about 3 minutes, until the cauliflower starts to colour. Season with salt, pepper and chilli powder and stir in the fresh coriander.